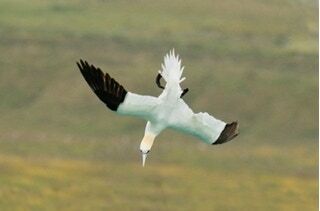 This amazing bird enters the water like an Exocet missile as it dives for its prey.A distinctive white bird with a yellow head and black wingtips.It nests on cliffs and they form a noisy large and pungent colony. 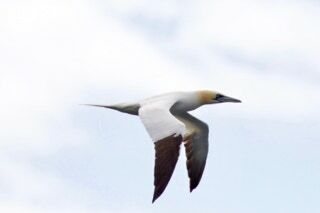 They are one of our largest seabirds feeding mainly on fish that they catch by diving head first in to the sea with wings folded back from a height of 30m. They hit the water at an astonishing 60 mph! They have air sacs between their muscles to cushion the blow. 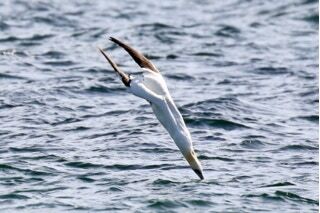 A truly spectacular sight to see 5 of these magnificent birds diving in unison! 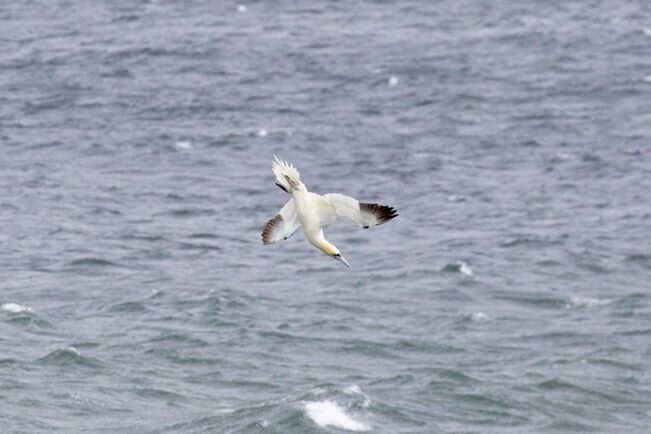 Around 220,000 pairs of Gannets nest around our coast. and live on average 17 years. They are amber listed and on the red list for birds. They are to be seen between January and August.